As I drove away from the curb, I had a strange feeling. And something was indeed out of the ordinary. I was heading off for 24 hours of free time– ME time— away from my kids and husband. I was so excited, yet the freedom was surreal. It’s hard as a mom to get any time away from our responsibilities. Mom life is 24-7, for 18+ years. It’s exciting and exhausting, fantastic and frustrating, and eventually, without any breaks, you get to a point where you feel like a banana peel that’s being constantly run over by a steam roller. We know as moms that we are supposed to love our families and make sacrifices for them. But sometimes we forget that while we are to consider others are more important than ourselves (Philippians 2:3), we are also to take care of ourselves. In the next verse it says in the Amplified version, “Do not merely look out for your own personal interests, but also for the interests of others.” (Philippians 2:4). It assumes that we do in fact love ourselves. I think one of the best ways we can love ourselves is to get some space and time away from our kids. It doesn’t have to be 24 hours like I got. That was something that won’t happen too often, though it was amazing. 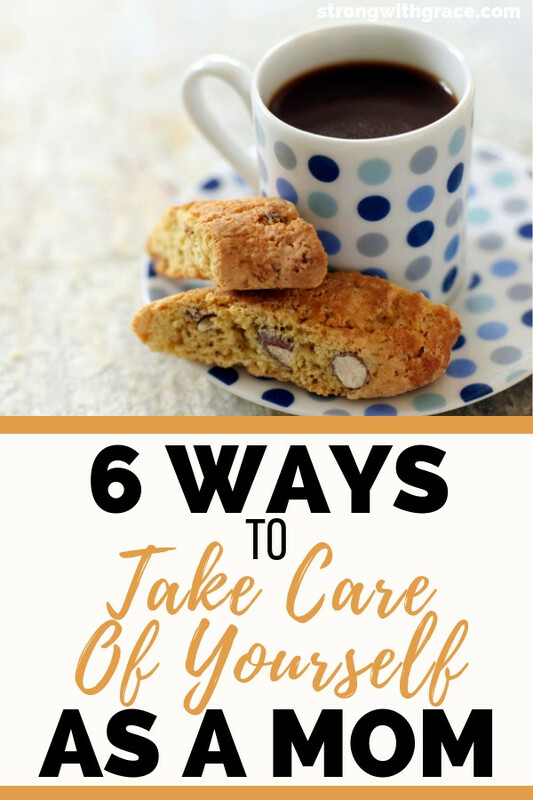 Here are 6 ways we can take care of ourselves first by getting a much-needed break. Carving out time to enhance and care for yourself phycially, mentally or spiritually can be a huge benefit. Some examples: attend a workout class at a gym with a kids room, join a Bible study with childcare, or take an online class in an area of interest that you can do after the kids are in bed (or when hubby can take over). You can also hire a babysitter for an hour and a half to grab a non-interrupted coffee date with a friend. It pays off later to grow and refresh as an individual apart from your kids. When is the last time you read an actual (non-kid) book? If your spouse is resistant to or nervous about staying home with the kids, start small. Venture out with short trips for errands or a small grocery run. Keep your outings nearby, then as he gains confidence, venture further out for longer. He might of had he known I was feeling so overtired and worn out. But amazingly, after 9+ years of marriage, he still can’t read my mind. Ha. I had been dreaming about the idea of getting away and finally decided to throw the idea out there to see if he’d be ok with it. He was very supportive. But he only had the chance to support me because I stated how I was feeling and what I thought would help me get refreshed. If had hadn’t have been up for 24 hours, we could have negotiated down to an amount of time that would work for both of us. Compromise is key. You have to start somewhere, so if you want to get away for an hour or 10 hours, you first have to bring it up. Getting away doesn’t always have to cost money or be far away. You could go on a walk or run, sit in a scenic spot, or even chill in your car for a bit. Hey, even grocery shopping kid-free is a breath of fresh air for those of us who usually cart our kids everywhere. I am homeschooling my oldest for kindergarten, so anytime I get to drive somewhere alone, I’m like “WOO HOOOOOO!” Kind of sad, but it’s the little things, right? It’s hard to leave your kids when they’re crying. It’s painful to tell them they can’t come with you when they are begging to be with you. But you have to know that they will be ok without you for a few minutes or hours. And so will you. Guilt can easily set in: You’re being a bad mom, they need you, you’re scarring them by leaving. But in most cases (only you know your particular situation and children), those negative voices in your head aren’t the truth. It’s important to pay attention to your feelings, but once you think them through you will most likely find that the feelings are more based on your fears and insecurities than on any actual facts. We can’t base our decisions on our fears. Take those feelings to Jesus and ask Him for His truth about the situation. He can free you from guilt and allow you to choose to go or stay from a position of peace. When you can’t physically get away, know that God can fill your cup. Throughout our marriage, my husband has deployed for many months while I solo-parented on the home front. I felt constantly drained taking care of everything around the house as well as trying to make life good for my sweet kiddos. I had many moments of exhaustion, frustration, and feeling burned out. But the Lord always gave me the strength for each day. He renewed me from the inside with His peace. My circumstances didn’t change, but I had a renewed spirit and a more positive mindset. If you just can’t get away, know that He is powerful enough to refresh you regardless of your situation. The next time you have that strange feeling like you’ve left something behind, I hope it’s because you are getting some much-needed time away to refresh your mind, body and spirit. That way, you’ll be filled and restored to be able to give your family all the love they need.